Universal twin post mounting design for stability and easy mounting construction. Available for various size flat panel TV monitor. Equipped with security screws for monitor security. Mounting posts have holes for wire management. 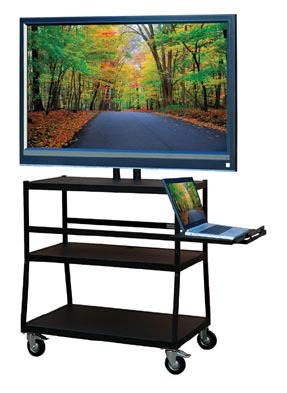 Pull out shelf for laptop and presentation use. Can be stored under top shelf when not in use. Equipped with swivel caster (two with lock). Come with UL listed/CUL approved 15’ cord, 4-outlets power strip with surge protector and cord winder. All models ship UPS and ready to assemble.